Britannia, located in the landmark Ballard Estate building in the business district and is nearly a 90 year-old establishment. This restaurant is one of the few remaining in the city that serves Parsi food. Parsi food is an Indian way of cooking Persian food – lots of nuts and dried fruits with Indian spices. This past Saturday my friends took off from work and I was fortunate to have the day off so we decided to go to Britannia for lunch. The restaurant is open only during lunch hours from Monday through Saturday and caters to the business crowd, regulars and tourists. The space is simple with a dash of nostalgia – with the chipping paint, old furniture and checkered table-cloth. 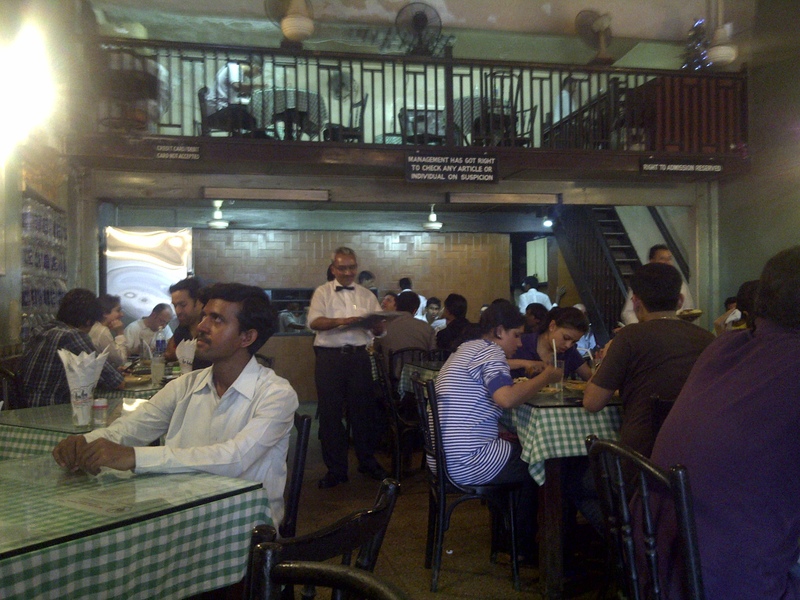 Read more about the history of Britannia and other Irani Cafes at the Irani Chai Mumbai, blog. My friends and I shamelessly ordered their most popular dish the mutton Berry Pulao, a rice pilaf made with crunchy fried onions, almonds, berries (tart berries imported from Iran) and spices. We also tried their patra ni machichi, pomfret covered in chutney made with cilantro, coconut and coriander. Traditionally it is steamed in a banana leaf ours was served to us in a foil. Our server deboned the fish as he served us and the fish came of the bone quite easily. Then we had the mutton Sali Boti, a tender cooked mutton gravy served with potato straws. I also had their raspberry soda to help me wash all this down. We were not done yet, we also ended up calling for the mutton dhansak. The dhansak is a thick dal in which the mutton is cooked and served with brown rice. I was reminded of the dhansak that mom makes at home. It is pretty close to the one that I had at Britannia. P.S. To get to the restroom you have to go through the kitchen, totally worth it. Reminded me of the Won Dee Siam (which is an amazingly good Thai restaurant in New York on 52nd St – this is a hole in the wall byob kinda place but the food is authentic. There are 3 locations but only one is good – 9th Ave and 53rd St corner). This entry was posted in Culture, Food, Travel and tagged Ballard Estate, Berry Pulao, Bombay, Britannia, Irani Cafe, Mumbai, Parsi Food. Bookmark the permalink. I laughed when you said “I was fortunate to have the day [Saturday] off”…. did the concept of a 1-day weekend take a while to get used to again? Your brother looked perplexed when I mentioned the “weekend.” He said there’s no such thing as a weekend, turned on his heel, and went to work! Still getting used to it. Tomorrow is saturday and I am in no mood to go to work Yep, he laughs about it when he sees how unhappy I am that I have to work a full day on saturday!